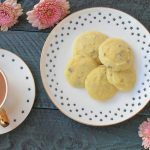 Delicious gluten free shortbread cookies with a hint of lavender! In an electric mixer or large bowl, mix all ingredients together. Use a small cookie scoop to scoop dough in columns of three on a cookie sheet with a baking mat.